How do I access the memory card slot in my Epson product from Windows RT? Touch: Swipe from the right edge of the screen, then tap the Search charm. Mouse: Swipe the mouse down from the upper-right corner of the screen, then click on the Search charm. 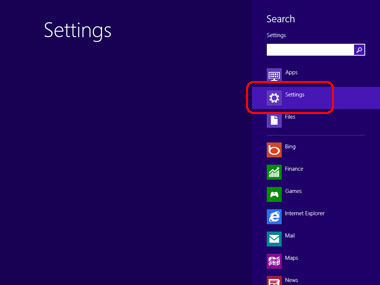 Select Settings in the right pane. Enter network computers in the Search field. Select View network computers and devices in the left pane. Find your product's name and enter it into the address bar of the window. 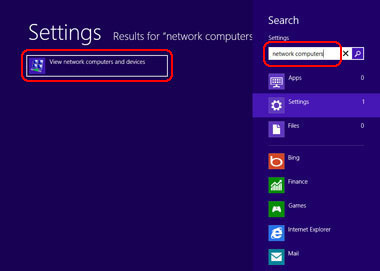 Note: If you don't see your product, make sure you're connected to the same network the product is connected to and Network Discovery is on in Windows RT. You'll see folders named MEMORYCARD and USBSTORAGE (access a USB thumb drive from the usb port of your product). Open the respective folder to access the files on the memory card or USB thumb drive. You can create a shortcut to the memory card slot. 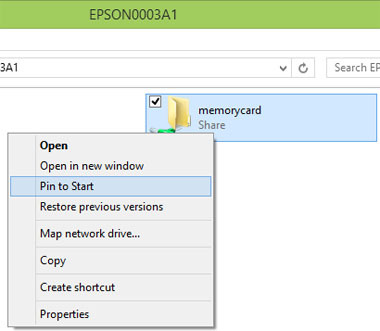 To create the shortcut, right-click the memorycard folder, then select Pin To Start. A memorycard shortcut will appear on the Start screen.